For centuries, scientists have asked the question: “What makes some people more likeable than others?” The result has been a flood of insight into human behaviour, psychology and relationships – many of which have flown under the radar. Being more likeable has a profound impact on both your professional career and life, as it defines how you create and maintain relationships, how you network, and how you interact with others. Have you ever caught yourself mimicking the behaviour of someone you’re talking to? You cross your arms as they cross theirs, or start talking softly because they are. While it may seem odd, psychologists have found this act of mirroring has a profound effect on how much a person trusts you. It’s a way of saying, “I’m just like you. I feel what you’re feeling.” This aids in building and strengthening relationships. Try it: The next time you chat to a colleague, consciously mirror their mannerisms. You’ll accelerate the bonding process, and create a sense of sameness. Tip: Show excitement when you see someone – and they will naturally mirror that excitement back towards you. Do it enough and you’ll start to make everyone feel excited whenever they see you. This social shortcut works hand-in-hand with mirroring, and is an easy way to get someone to agree with what you’re saying. Simply nod your head while you talk, and the person with whom you’re speaking will unconsciously feel that what you’re saying is true and desirable. They’ll be more inclined to agree with you, and see you as more likeable. The Benjamin Franklin Effect teaches us that when you ask somebody to do you a favour and they oblige, they’re more likely to do you a favour again in the future. Researchers found that when someone agrees to do something for you, they go through a rationalisation process – convincing themselves as to why you’re worth doing the favour for. In other words, they tell themselves why they like you. Added to that, they feel as though they have something that you don’t. It makes them feel admired and respected, and this instantly raises their opinion of you. Try it: The next time you’re having trouble with getting a colleague to like you, ask them for a favour. This can be anything from sharing some of their knowledge on a certain subject, to asking them if you can borrow their pen. Fact: Benjamin Franklin invented many things, but refused to patent them – saying that it was enough that his creations helped others. Just another reason why he was so likeable. Ever feel like someone’s invading your space if they point at you? This is because the gesture of pointing is generally seen as aggressive and rude. Want to seem more likeable? Stop pointing and start using the open-palm gesture. Psychologists say that opening your hands conveys trust, and makes you come across warm and friendly. Try it: The next time someone asks you for directions in the office, instead of pointing, use your open-palm gesture and “present” the directions. Fact: The employee policy at LEGOLAND made the open-palm gesture mandatory for any employee giving directions. The secret to active listening is to put yourself on hold while you take in what’s been said. How? Stop thinking about what you’re going to say next; stop evaluating what they’re saying; take a deep breath, and just focus on the message. Try it: When you’re listening and can’t seem to get what you want to say out of your head, pretend as though you’re physically pressing the pause button on your thoughts. You have two types of smiles – your fake “Say Cheese” smile and your genuine “Duchenne” smile. The difference? It’s all in the eyes. Studies have shown that when people fake a smile, they use different facial muscles, and their eyes don’t crinkle. That’s the biggest giveaway, and a huge problem for when you’re trying to get people to like you. Whether building relationships at work or in your social life, a smile is one of the most important tools in your arsenal. Make sure you’ve got it right. The good news? 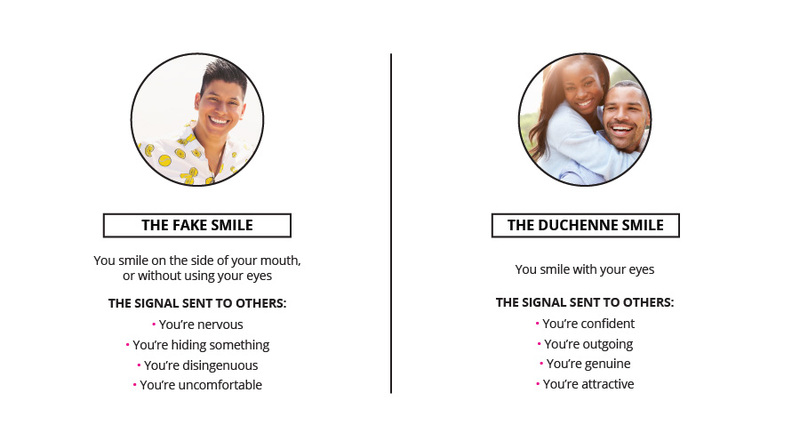 You can train yourself to fake a Duchenne smile if you have to. Try it: First, look at photos of yourself when you were genuinely smiling, then practice squinting a little when you smile. If your eyes start to crinkle slightly and look similar to the photos – you’re doing it right. Remember – everything in moderation. Smiling too much may make you lose your credibility; nodding too much may turn you into a bobblehead; and mirroring a person’s every move may come across as slightly creepy. So, use these shortcuts skillfully, and you’ll soon be the light of the room. Want the skills to back up your confidence? Browse over 60 short courses designed to help you stand out from the crowd.